A racing game, in which the players are trying to win races on the streets of Miami. The approachable controls are a characteristic trait of the game – during the game, the players aren’t given full control of the vehicle. They can only accelerate, brake and use boost. Miami Street is a racing game developed by Electric Square – the sister division of Studio Gobo that co-created titles like Disney Infinity and For Honor. 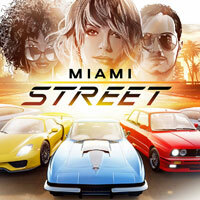 Miami Street is distributed as a free-to-play game with microtransactions. In Miami Street, the players participate in illegal one-on-one night races on the streets of the titular city. The game features an advanced championship that can be played for hours and short events that can be completed in a few dozens of seconds. The battles for victory are fought by controlling one of the licensed vehicles. As the players progress through the game, they gain access to modifications that improve the parameters of the vehicles. This enables the drivers to participate in even more challenging races. What distinguishes the game from other racing games are controls. During the game, the players don’t have direct control of the vehicle – they only accelerate, use brake and boost. The key to victory lies in timing the use of specific options and in having a perfect reflex. The race can be observed through various cinematic cameras. The three-dimensional graphics of Miami Street are of decent quality, just like the sound layer of the game (including the engine sounds). The game features approachable controls.